So things have slowed down a bit around our area when it comes to practicing our barn hunting skills. The place we normally practice had an illness that went through the rats and a few died, so we had to take a little time out. The time out wasn’t because the dogs would catch something from the rats, the rats had to recover. But luckily we have a friend who has set up a beautiful practice area that is covered and heated! So we headed out for a long overdue practice. After weeks of not practicing our huntings skills, Riley was ready to jump into the bales! We started off with finding two rats, one up high in the bales and the other down low on the ground. 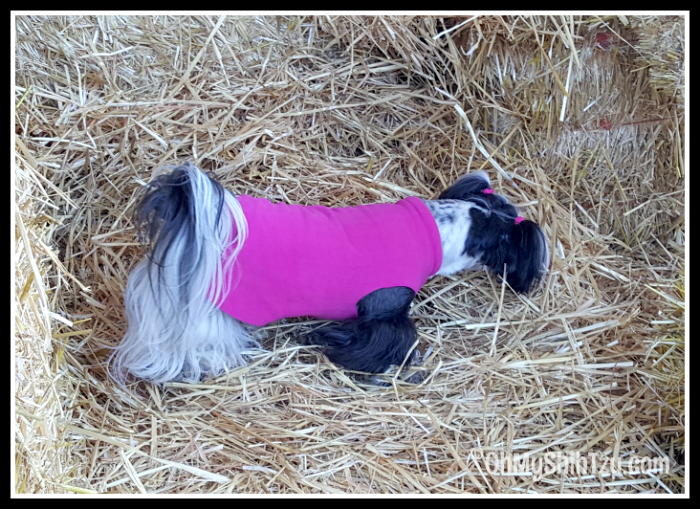 As soon as the leash came off and she was released she immediately headed to the top of the straw bales in search of the tube with the rat. She found the rat quickly and immediately went to the ground, through the tunnel and then proceeded to find the second rat! Wow, what a good girl. So now we get a break and some treats! As we took our break and waited for our next turn we decided the best place to be was taking in the morning sun. 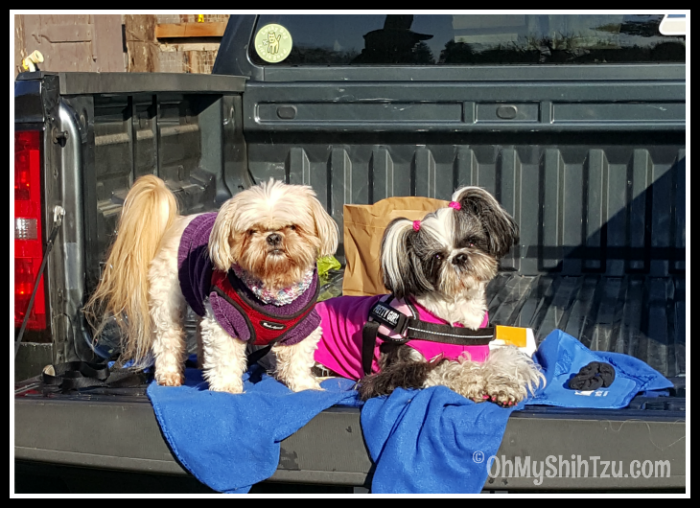 The tailgate of the truck seemed to be the perfect spot! JP (hubby) decided it was a good idea to give the girls a little exercise during our little break, so he took Katie for a little walk. I haven’t introduced Katie to the rats yet so she comes along for moral support. After Daddy & Katie came back I thought it would be a good idea to take Riley for a walk also and introduce her to the resident mule. Now even though we are at a Barn Hunt practice I forgot Riley has a love for all animals and it turned out that introducing her to the mule was the biggest mistake I could do. So when it was her turn to hunt for the rats she had only one thing on her mind. 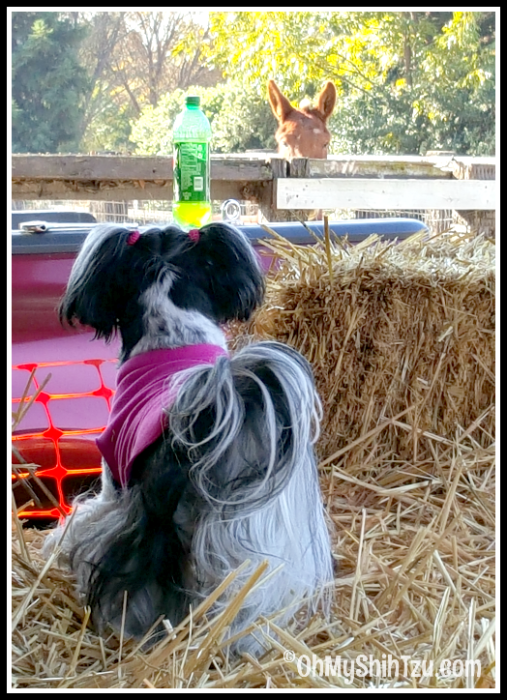 And that was to figure out a way to get a better vantage point to see the mule rather than hunt for rats. Apparently the mule wanted to see her too! I’m hoping that this fascination with the mule doesn’t last too long. Hopefully the next time we head out there she wont remember the mule. 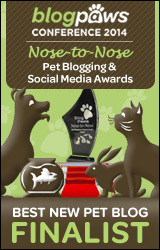 What is your dogs biggest distraction? Let me know in the comments below. Loved this post! It’s wonderful to watch beloved pets do their special jobs. I’d love to see a video of Riley hunting – mules or rats – or better yet- both!